I had a HUUUUUGE SQUEE today because my dear sweet hubby bought me the table top light studio I’ve been lusting after for months. Now I can learn how to take more professional photographs of my food! So in honor of the squee, I pulled out the dried porcini mushrooms that I reserve for special occasions and the half pound of crimini mushrooms that HAD to be cooked tonight before they descended into sketchy territory. And once I got to digging, I found some dried shitakes as well. Somewhere or other last week I saw a recipe for homemade mushroom soup, and I used that as the inspiration for dinner tonight. So without further ado, here’s this week’s entry for Souper Sunday, hosted by Kahakai Kitchen. 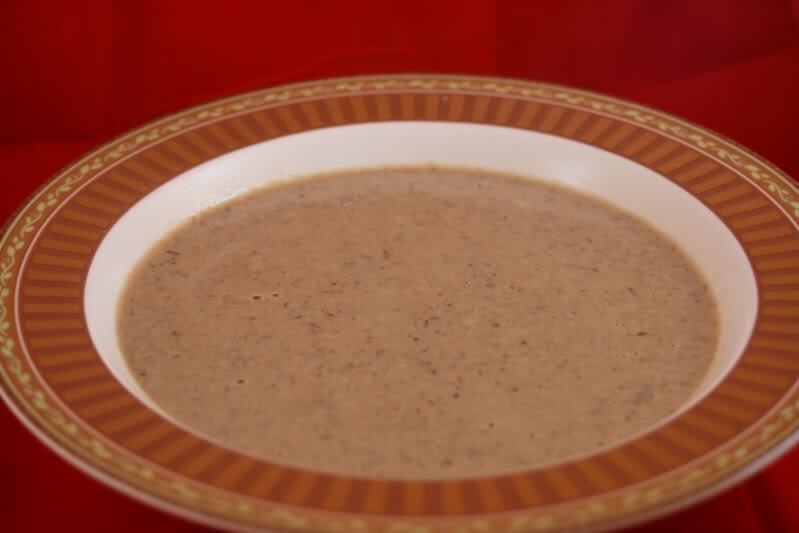 Place the dried porcini mushrooms into a large measuring cup and cover with 2 cups of HOT water. Allow to steep at least 20 minutes. Same treatment in a different measuring cup for the shitakes. Meanwhile, mince the garlic, dice the onion, and pull out all the rest of your ingredients. Melt the buttery stuff and add in the onions, garlic, and all mushrooms. Sweat them until the onion is translucent. Stir in the flour and cook for approximately 2-3 minutes to remove the raw flour taste. Pour in the mushroom juice and wine and simmer for approximately 10-15 minutes. Remove from heat, add half and half or cream and use an immersion blender to puree the soup. I wish I’d had some creme fresh to garnish this with because it would be beautiful and tasty, but this was just fine as is. We added some chives, which provided a nice subtle extra zing. Yummy yummy! I am really into mushrooms at the moment. That looks really nice! It was really lovely. I adore porcini mushrooms and anything that entails using their reconstituted “juice”. It’s such a great flavor in broth for stuff. I’m sure this would be even better with real butter and real cream, but hey, dieting here. Lucky you with the photo studio! Someday…. Thanks for sending your delicious soup along to Souper Sundays. I am a big fan of mushrooms. Just got the round up posted.